Easy Paleo and gluten free pancakes without flour. People often ask me what do I take for breakfast. As you can imagine I do not consume any store bought cereals or milk but I do stress on how important breakfast is and there is not a day I go without it. I like to start the day with a smoothie and usually use what fruit and veggies I have at hand in the fridge then add any super food like flax seeds, cocoa nibs, spirulina or berries. To accompany my herbal tea, I also like to have some home made goodies. You can find recipes for muffins, biscotti, cakes and cookies here or if you fancy original breakfast items like flapjacks, homemade granola and breakfast bars you can find them here. If you have eggs and banana at home then you can make these easy pancakes. I find them very convenient to make during lazy weekends. Adding cinnamon, flax seeds, honey and berries gives them a complete finish and you will surely enjoy indulging in them. Remember to grind flax seeds as this is the only way you can get the benefits out of them. Whole seeds are not digested by the human body. I find frozen berries to be very convenient as buying fresh berries is usually expensive. For winter you could warm up the berries in a sauce pan however being summer I just rinsed the frozen berries and they were quickly towed while still remaining cool. This way we enjoyed a duo of mouth feel, with warm and cold in one breakfast. These could also be a great pre-workout meal. Use half of the ingredients for a single serving. Place skinned bananas in a bowl and mash them with a fork. Add the eggs to the same bowl and mix thoroughly. Combine the cinnamon with the mix. Warm up a large sauce pan (you can use a pancake pan if you have one). If the pan is not non-stick add some coconut oil before heating. Use a dipper or large spoon and place some batter on one side of the pan. It will automatically form a round shape. Then add another spoonful of batter on the other side of the pan. This way you can cook 2 pancakes at a time. if you are using a pancake pan just place one spoonful at a time. The batter will make between 6 to 8 cakes, enough for 2 persons. When the side of the pancake is cooked (after about a minute), flip over and cook for a further minute. Rinse the frozen berries in a colander and remove excess water. Set aside on a paper towel to absorb excess moisture. 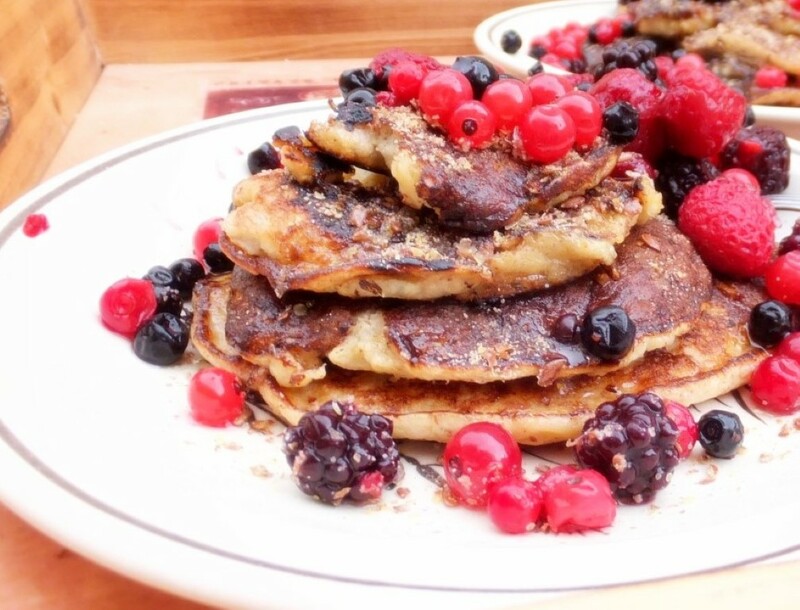 Stack 3 or 4 pancakes in each plate and sprinkle ground flax seeds on top. Dip a fork in honey jar and drizzle over one plate. Leave the fork on that plate. Repeat the same with another fork on the second plate. Finally, dress with berries and enjoy!